Here are four easy-to-follow tips you can use to build a solid pre-workout nutrition plan. By following these simple steps you're bound to make noticeable gains. Give these a try for exciting new gains both in and out of the gym. What you take before your workout can make or break not only your performance in the gym, but your gains in rock-solid muscle. Follow these 4 simple steps and you'll be on the path to anabolic muscle growth from the very first rep. When it comes to nutrition, it seems as though the majority of bodybuilders—beginners and intermediate lifters in particular—place a greater emphasis on ensuring that their post-workout nutrition is bang-on. 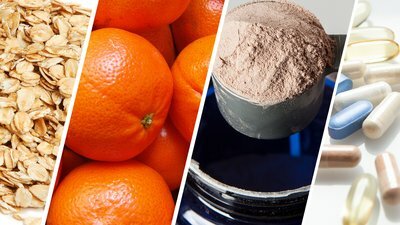 The first thing that generally comes to mind when thinking about nutrition are the terms "whey protein," "creatine" and of course, the notorious "post-workout anabolic window." There's no question that your post-workout nutrition is critical to your success. But, what many people often overlook is the vital importance of pre-workout nutrition for long-term muscle-building goals. A sound nutrition regimen, if followed correctly, will help you experience dramatically noticeable gains in muscle size and strength. To visualize the importance of pre-workout supplementation, picture your body running on an empty stomach while training. You may feel a little sluggish and your performance may suffer. If you're lucky, you may still achieve a little bit of a pump. But what you may not realize is that you're experiencing a dual negative effect. For starters, because you're running on near empty, your glycogen stores will be rapidly depleted. And once they are fully depleted, your body turns to your hard-earned muscle as its next closest source of available energy. The other negative consequence of improper pre-workout nutrition is that, when running on fumes, your intensity and strength capacity suffer. As a consequence, you're unable to push yourself to the limit, leading to a less-than-stellar performance in the gym. The end result: you're unable to stimulate your muscle fibers to the breaking point at which they'll form new scar tissue and new muscle mass. This is where the old adage "make every rep count" plays such an important role. And as you can now see, ignoring your pre-workout nutrition can be the difference between packing on more rock-solid muscle and remaining at yet another stubborn growth plateau. As a general rule, your pre-workout nutritional regimen should be broken down into two phases. The first phase consists of having a meal one to two hours before working out (depending on your metabolism). The second phase takes place 15 to 30 minutes before working out and consists of supplements that you will consume to further fuel your workout. Here are four easy-to-follow tips you can use to build a solid pre-workout nutrition plan. In order to power through your gut-wrenching, muscle-fiber-tearing workout, you need a premium source of fuel. That's why it's fundamentally important that you consume a slow to moderate digesting source of carbohydrates. Not only will they provide a source of energy, thereby preventing your body from tapping into muscle for energy, but a slower digesting carb will sustain you throughout your entire workout. This is why it's not recommended to use mainly high glycemic or fast-digesting carbs as you'll quickly burn out once their energy source is used up during your workout. Fruits, such as oranges, make an excellent addition to your pre-workout meal. Now that you have a slower digesting carb source (as outlined above), it is also beneficial to have a small but sufficient source of fast-digesting carbs to kick-start your workout. Oranges provide this type of quick energy source. That's why you always hear bodybuilders talking about eating or sucking on oranges before a workout. Aside from providing a solid source of simple carbohydrates, oranges are packed with vitamin C and electrolytes. Bananas and apples are also excellent options if oranges are not to your liking. Of course, no meal is complete without protein. As the building block of new muscle growth, protein—composed of essential and non-essential amino acids—is vital to maintaining a positive nitrogen balance necessary to stimulate maximum protein synthesis. Obtaining the correct ratio of amino acids is vital to achieving an anabolic state and the best way of achieving this is by consuming complete protein sources such as egg whites, chicken, turkey and even skim milk. Another option for people on the run is to consume a whey protein shake, which provides a balanced source of quality amino acids necessary to achieve a positive nitrogen balance. As a general rule, consume between 20 to 40 grams of protein in preparation for your training session. Now that you've got your pre-workout nutrition out of the way, which by this time is almost completely digested, it's time for your final preparation in the form of sports/dietary supplements. There are a plethora of supplements to choose from. So, when scanning store shelves be sure to select a fast-acting supplement that will quickly absorb into the bloodstream so you can feel rapid energizing results. Products containing a combination of caffeine and arginine are extremely popular choices, and rightfully so. Caffeine promotes increased focus, intensity and energy in the gym. Arginine-based supplements are another popular choice because they are designed to activate peak vasodilation, resulting in powerful muscle pumps. Achieving a good pump is vital to new muscle growth because it helps deliver key musclebuilding nutrients, oxygen and amino acids to working muscles, effectively creating an optimal anabolic environment conducive to new growth. Now that you have the knowledge necessary to create an effective pre-workout nutrition plan, it's time to put these words of advice into action. By following these simple steps as well as ensuring that the rest of your daily diet is in check, you're bound to make noticeable gains in size and strength. Give these simple, easy-to-follow tips a try and you're guaranteed to notice results both in and out of the gym. There's a new force driving the monstrous physiques that rule the bodybuilding world - Six Star Muscle - and it's causing all h_ll to break loose.